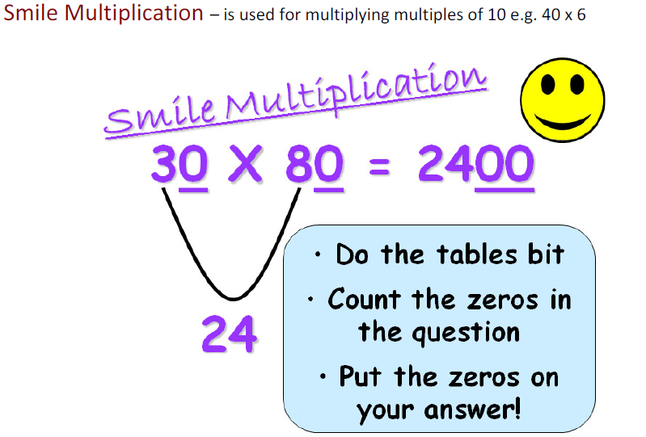 BIG Maths is a teaching approach that makes progress in maths easy and fun. BIG Maths has been extremely successful both nationally and internationally with thousands of children learning through daily BIG Maths ‘CLIC’ sessions and the weekly ‘Beat That!’ challenges. Big Maths firstly answers the question, ‘How do we get children properly numerate as they journey through school?’ It provides us with an accurate and simple, but highly effective, framework that guarantees numeracy progress. This framework is known as CLIC (Counting, Learn Its, It’s Nothing New and Calculation) and is characterised by accurate steps of progression (known as Progress Drives) that make new learning easy and obvious to children by cashing in on the timeless natural laws of Maths. BIG Maths is therefore a rigorous, systematic and structured approach that provides children with a fun and lively experience as they learn through jingles, songs, games and the BIG Maths characters. heart of the learning experience. 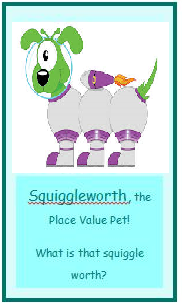 Don't be surprised if your children come home talking about Clic, Pom, Pim, Squigglesworth or Count Fourways. They will be talking about Big Maths which is being introduced throughout Whitchurch Primary. Big Maths helps children to understand the links between core numeracy (the basic principles that underly all maths) and outer numeracy which is the application of these core principles. 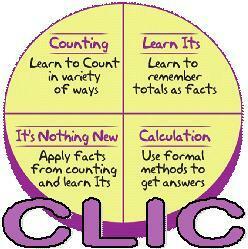 CLIC stands for ‘Counting’, ‘Learn Its’, ‘It’s Nothing New’ and ‘Calculation’. Maths lessons contain each of these elements. Children will count forwards and backwards in all kinds of steps depending on their level e.g. in 1s, 2s, 3s, 6s or even 25s! When practising counting at home with your child, make sure you go forwards and backwards. Don’t always start at 0 – make sure they can count on from 75 to 106 for example. ‘Learn Its’ are addition facts and times tables facts. There are 72 Learns Its in total; 36 addition Learn Its and 36 multiplication Learn Its. These are facts that children need to learn off by heart, so when they are asked ‘What is 6+4 ?’ they are able to give the answer as quickly as they would be able to tell you their name. 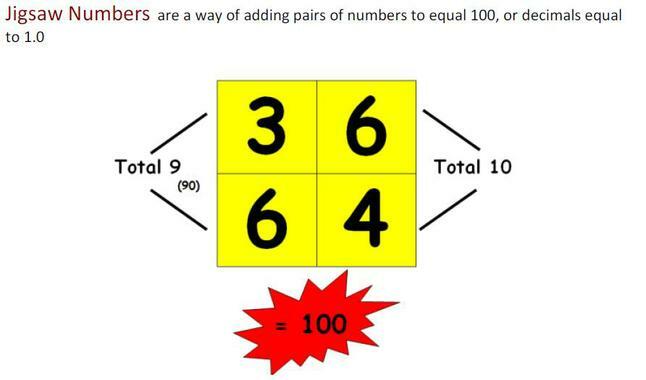 As soon as they know 3x5=15 they also know 5x3=15 (This is known as a ‘Switcher’). measures such as ml, m, cm, kg, whilst understanding the underlying number concepts. 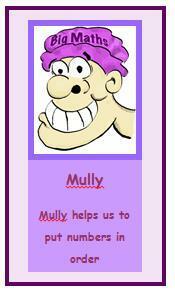 Strange phrases such as ‘Jigsaw Numbers’, ‘Smile Multiplication’ and ‘Where’s Mully?’ are all part of this section of Big Maths. This aspect of CLIC is when the teacher will focus on developing the children’s understanding of addition, subtraction, multiplication and division. Big Maths maps out which steps children should do in a clear order and helps teachers to identify where to go back to if a child needs extra support. 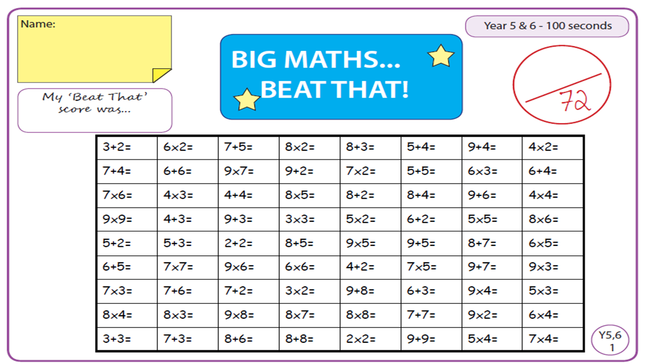 Big Maths Beat That is a weekly timed test of your child’s Learn Its. The aim is to improve their individual score each time! How can you help your child? Sut allwch chi helpu? Big Maths is a very useful tool to help children become numerate… but we still need your support at home. Help your child practise their Maths at home – a few minutes a day is all you need. Insist that numbers are written the correct way round. Congratulate your child if their Big Maths score goes up! Click HERE to visit the BIG Maths website.